Nobody Gets the Girl | Blah! I’m a big comics fan. Not the biggest, I’m sure, but I enjoy comic books. And I mostly read superhero comics, my favorites being X-Men, Fables, The Ultimates, Powers and Supreme Power. There are a number of novelizations of comics or comic-based movies, none of which I’ve read. However, there are also a couple of stand-alone novels based upon the comic book conventions that I’ve found and really liked. The first was Superfolks by Robert Mayer. It was really good. It was about a superhero that is going through a midlife crisis. 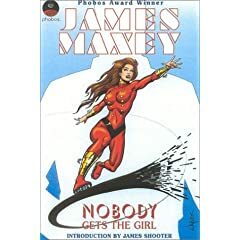 The second is Nobody Gets the Girl by James Maxey. In some ways, this is a very conventional superhero story, including an origin story for the hero, the typical battles, and the weird pseudoscientific explanations for things. But, it gets a lot darker than most superhero tales. There are probably no real “good guys” and the bad guys, of course, don’t see themselves that way. In their own mind, they are freedom fighters, fighting against the supreme “good guy”, who wants to create a utopia at the cost of personal freedom. The hero, Richard Rogers, is a regular guy who is going through a bit of a crisis. But, he wakes up one day and his whole existence is gone. The world he knew, the people he knew — including his wife — no longer exist. Or, better said, they exist, but have no knowledge that Richard ever existed. Soon, he learns the reason for his predicament, which has to do with a scientist traveling in time and preventing Richard’s conception. He joins the scientist’s super-team, comprised of his two daughters, and tries to help the scientist — nicknamed Dr. Know by his daughter — implement his utopia while protecting him from his arch-enemy. The story is well written, fast paced, and while using some of the unrealistic pseudoscience that comics always use to explain things, the world that Maxey sets up to explain the existence of super powers and such is novel. It relies a bit too much on quantum physics, which all of these things seem to these days, but it does so in a unique way. Furthermore, Maxey places his story in the “real” world, with the political problems that we face in our own world. When super-powered terrorists attack cities, many, many, many people die, as you would expect if such things could really happen. It’s not like the Marvel or DC battles in which cities are destroyed, but it seems that no one really dies. In that sense, the story is a bit more realistic (in the vein, in some ways, of The Authority). The characters are compelling and interesting. Their powers are also interesting and well utilized; one daughter has Magneto-like powers but uses them in a completely novel way compared to Magneto. Overall, I highly recommend this book to anyone who likes the comic book/superhero genre. It is an intelligent take on the genre, with enough unique twists and turns to keep the reader engaged. And it is a relatively quick read too. Not like a comic book, but still pretty fast. Previous PostIndy wins!Next PostMore snow photos!